Play Vex 4 Game Online at Vex4.org. 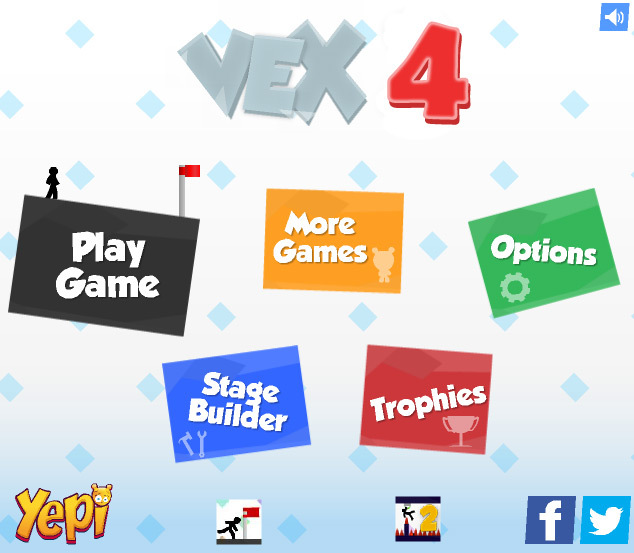 Vex 4 is latest version of this addicting Stickman game series. Vex 4 brings back the stick hero and it is even better now in this game. You can slide, climb, jump or run so that you can reach to the victory in the action packed and thrilling adventure game regardless of your age. To win, you should have what it takes to beat all the 25 levels. The hotkeys that are used in this game are the same as these that are used in the old models of the game. You may choose to play using W, D, S or A keys and arrows keys also work to direct the stick figure hero in a direction that you wish him to take. You may also press at the M key in order to mute the music of the game and other sounds effect. You may also do it at the option panel. Other keys that can be used are L, K and J in order to activate some power-ups which may be bought from the game shop. To play Vex 4, you will have to decide about many characters found in the game and you have to choose them at the beginning of the game while you continue to advance within the entire game. At the start, you will have to start using two basic characters which are female and male stick figure. When you progress, within the levels, you will be unlocking the characters which may include a mean bear or a cute kitten. The game has 25 new levels or new acts that have to be completed. With every act, you will have to collect as many stars as you can. Such stars are going to give the character that you have chosen the score points and it will grant you to get in-game cash. The cash can be used to buy the power-ups and items from the shop. You should keep the eye out to get the stars whenever you can. There are some stars that are not that easy to get. As you complete the games, you are going to be able to unlock many stages in the game and you can unlock the achievements in the trophy room. When you complete a certain achievement, you are going to get the achievement in terms of the score points and you will get bonus cash in order to spend it on the shop. To win you have to unlock at least 25 achievements. Vex 4 has new features that you can only find in the Vex 4. There are new power up and many new items which you can use to buy things and to boost the stick man hero. There are some power-ups in terms of the power jumping shoes and speed boosters. There are simple items that can make you to customize the appearance of the characters like a rocking hair do, different color shirt and cute hat.